How do you cap a strong first impression? 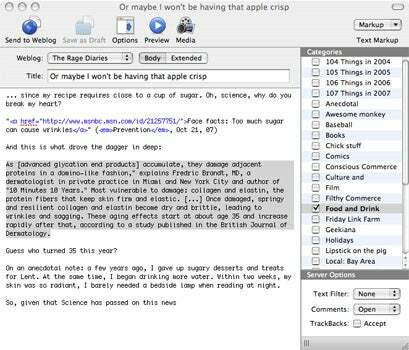 If you’re Red Sweater Software, maker of desktop-based blogging tool MarsEdit, you refine the features that made your product appealing the first time around, and you solve a few setting and formatting issues from earlier versions. MarsEdit 2.0.4’s big appeal is peace of mind: You can compose posts locally and archive your work. Anyone who’s ever lost a Weblog post owing to a browser freezing or site going down will appreciate this tool. One of MarsEdit’s great strengths in its prior edition ( ) was the ease with which bloggers could set up the software to publish to specific types of blogs. A new feature extends this smooth transition between the desktop and the Web: You can now add your Flickr photostream in MarsEdit’s Media Manager. With two clicks, I had authorized the software to access my photostream, and MarsEdit downloaded my most recent shots. If you include a lot of images in your posts, this can simplify the composing and editing you do offline. The Media Manager’s usefulness extends beyond Flickr. If you have multiple blogs, you can share images between them thanks to a centralized image library; this is an elegant way to reuse images across several blogs. MarsEdit 2 packs both content and customization features into a relatively small space. While the previous version of MarsEdit was most effective for bloggers who had a working grasp of HTML, this update is friendlier to markup newbies. To start a new post, just choose the New Post option and begin typing in the pop-up window. To format the text in the new post, highlight the chosen text, then select the specific option from the Markup drop-down menu in the upper-right corner of the window. Although your post will be filled with markup tags instead of WYSIWYG text, it beats figuring out how to format a post yourself. However, one formatting quirk persists: it’s still necessary to insert paragraph tags at the beginning of each paragraph, despite the local preview pane showing properly formatted text. So don’t toss your copy of HTML for Dummies just yet. I found a script that inserted the paragraph tags in entries, but it required poking around through assorted menus. This feature could be made easier to find. This version of MarsEdit has corrected one of the few downsides of the previous version by letting you set the preferences for both comments and trackbacks. You can access this feature by clicking the Options button in the toolbar at the top of a new post’s window. A pane slides out with the blog’s categories, plus server options regarding text formatting, comments, and trackbacks. One of the nice touches in this new interface: If you’ve pasted a URL into your clipboard, selecting the Add Link option will produce the required field with the hyperlink already pasted in. This is a timesaver for people who are switching between a Web site they’re writing about and a post they’re composing. MarsEdit 2.0.4 is worth considering if you’d like the comfort of composing your posts locally and keeping back-up copies. In addition, its media management tool is simpler and more intuitive than many other Web-based options.